Brú na Bóinne Visitor Centre - the access point to Newgrange and Knowth. Newgrange.com has been an online resource since 2007, supported by Boyne Valley Tours. Access to Newgrange is only by guided tour from the Brú na Bóinne Visitor Centre on the south side of the river Boyne. Newgrange is on the north side of the river Boyne, visitors cross the river by pedestrian bridge and take a shuttle bus to Newgrange. There is no direct public access to Newgrange by road, except for the mornings around the Winter Solstice. Directions to the Brú na Bóinne Visitor Centre. Tours of Newgrange and the Boyne Valley. Accommodation in the Boyne Valley and surrounding area. 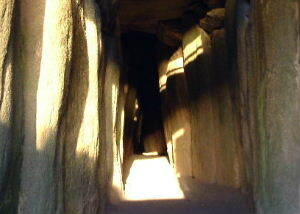 Newgrange is best known for the illumination of its passage and chamber by the winter solstice sun. Above the entrance to the passage at Newgrange there is a opening called a roof-box. This baffling orifice held a great surprise for those who unearthed it. Its purpose is to allow sunlight to penetrate the chamber on the shortest days of the year, around December 21, the winter solstice. At dawn, from December 19th to 23rd, a narrow beam of light penetrates the roof-box and reaches the floor of the chamber, gradually extending to the rear of the passage. As the sun rises higher, the beam widens within the chamber so that the whole room becomes dramatically illuminated. This event lasts for 17 minutes, beginning around 9am. Newgrange's accuracy as a time-telling device is remarkable when one considers that it was built 500 years before the Great Pyramids and more than 1,000 years before Stonehenge. The intent of its builders was undoubtedly to mark the beginning of the new year. In addition, it may have served as a powerful symbol of the victory of life over death. Each year the winter solstice event attracts much attention at Newgrange. Many gather at the ancient tomb to wait for dawn, as people did 5,000 years ago. So great is the demand to be one of the few inside the chamber during the solstice that there is a free annual lottery (application forms are available at the Visitor Centre). Unfortunately, as with many Irish events that depend upon sunshine, if the skies are overcast, there is not much to be seen. Yet all agree that it is an extraordinary feeling to wait in the darkness, as people did so long ago, for the longest night of the year to end. A Passage to the Afterworld - the story of New Grange. Description of Newgrange - by Claire O'Kelly who worked on the excavation of Newgrange. Newgrange Images, Aerial Images and more Aerial Images. Images from inside the Chamber and more Images. Prof. Michael J. O'Kelly who excavated and restored Newgrange. Newgrange Excavation Report Critique - by Alan Marshall. 1837 Map showing Newgrange and Knowth. Newgrange Tumulus from Wakeman's handbook of Irish antiquities.